So how accurate are those global warming predictions? Evidently most are not very accurate at all. From Fox you can read about “8 Botched Environmental Forecasts.” There’s more, like the MET Office in Britain predicting a mild winter in 2010-2011, not to mention other warmists faux pas. Below is one to whet your appetite. Considering all the Snowmageddons we’re having it seems very appropriate. Britain is even set to possibly have the coldest winter in 1,000 years. Yes 1,000, not 100 not 10. Well, I”d suggest Dr. Viner go ask someone in the UK or NYC about this “rare” snowfall. He could also ask anyone in much of Europe. Germany got snow bombed and Paris basically shut down, including the airport. Snow was even reported in Rome and the Island of Capri. Even Miami is having the coldest December on record. 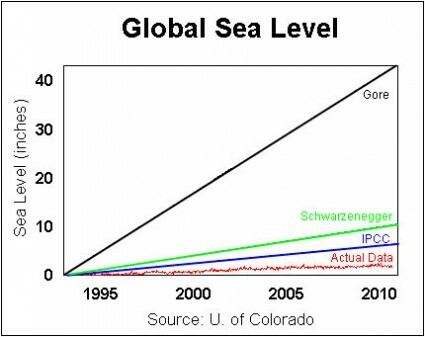 You can read the whole thing here, but you can see from the chart below that those predictions that have idiots proclaiming that New York City will soon look like Atlantis are a joke. The warmer predictions and the above chart ARE proof that P.T. Barnum (or whomever said it) was correct when he said “There’s a sucker born every minute.” It seems to me that big Al and the AGW crowd have found most of the suckers on the planet who continue to believe in global warming when it’s blatantly obvious it’s a total crock of BS. So, next time you hear some BS prediction that we’re all going to die from global warming I’d suggest you do some nosing around before you put that $20 into the Church of Global Warming’s donation basket. If you’re going to believe forecasts I’d suggest you check out Piers Corbyn or Joe Bastardi, who seem to have a much better record than the warmers who seem to base their predictions upon what they wish would happen instead of reality. H/T: Watts Up With That? I agree that we are in the grip of the biggest and most insane hoax in history, and unless the public get wise to it soon, we will all be parted from what wealth we have. No matter how a restriction on the use of these is implemented even a 10% decrease will make the price of petrol go sky high. In otherwords, (and petrol is just one example) we can expect, if the IPCC has its way, a price rise on petrol of greater than 500%. The fact that the emission reduction cost issue is not discussed, leads me to believe that there is a deliberate cover up of this issue. Fairly obviously the possibility of starvation will hardly appear to the masses. You are dumb. Technically it’s not called global warming, it’s called global climate CHANGE, implying that there will be extremes in both directions. Educate yo self. I assume “smart guy” in your case is an oxymoron?